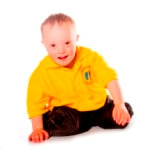 Simon and Debby Spicer first got in touch with Cerebra for support when their son Alfie, was born with Down syndrome. Cerebra has been a huge help in supporting the family and tackling the many unforseen challenges Alfie’s condition brings. The Innovation Centre produced a unique, specially made frame for Alfie to sit in as his poor muscle tone made traditional high chairs unsuitable. We have also funded hydrotherapy and physiotherapy to develop Alfie’s muscle tone. In gratitude for the support they have received Simon and Debby have allowed us to use Alfie’s photo in publicity and he has starred in numerous campaigns. Simon has also fundraised for the charity through his work at the Ford plant in Southampton. Being able to rely on the support from Cerebra has made a huge difference to Simon and Debby as they have adapted to parenthood.